For many of us, a house without books can never be a home. Books make a place feel lived in; when someone has built up a large collection of books, it’s fair to assume they have been in the same place for a while and plan to be there for at least a while longer. Books, perhaps more than any other object, reveal the character and interests of the inhabitants. Not only that, they can be beautiful design objects in themselves. It may be sensible to avoid judging a book by its cover, but there’s no denying that some books just beg to be displayed, as much for their aesthetic as for their content. Collectively, as well as individually, books can liven up a dull living space, adding colour and diversity. There are so many ways to make books a key feature of your interior – here are just a few. Who said a bookcase had to be rectangular? 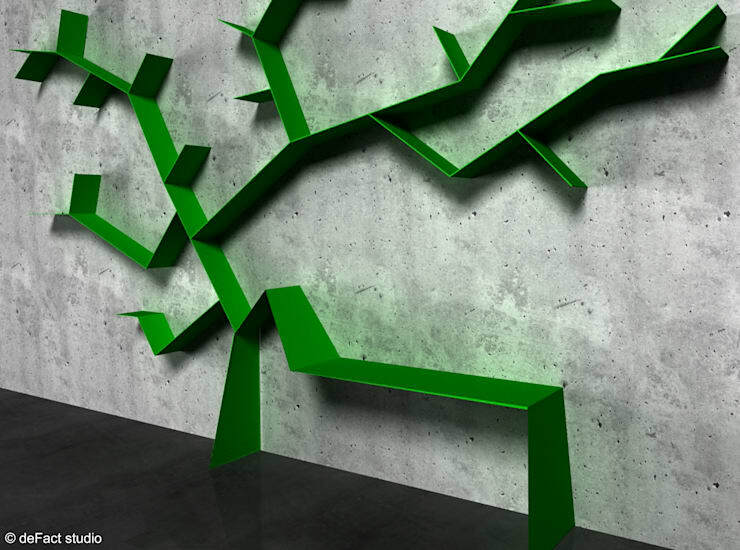 With innovative designs like this incredible nature-inspired one, you can wave goodbye to all those limiting traditions of shelving – you know, things like straight lines and right angles. There could be no more apt way to show off your literary side; books begin life as trees, after all, so why not help them get back to their roots (no pun intended)? There is something timeless – and intriguing – about a wall of books. Left alone in this room, who could resist turning around and sneaking a look at the titles, or even lifting one down and having a leaf through? Giving books such a prominent position in your living room almost invites visitors to engage with them, and quite likely to start a conversation in the process. There are few better icebreakers than a good book. And not only that, they look fantastic too, adding a dash of personality to the otherwise simple furnishings seen here. You don’t always need to display your books in some elaborate or inventive fashion, or even to display them en masse at all. Placing a few books here and there to fill spaces and brighten up a empty expanse such as a kitchen worktop. Pick big, bold, beautiful books for this – they’re going to attract closer scrutiny than the ones huddled together on your shelves. The obvious choice for the kitchen is cookbooks (it’s probably the most sensible place to keep them anyway, appearances aside). Stacked as seen in this picture, there’s no need for bookends. 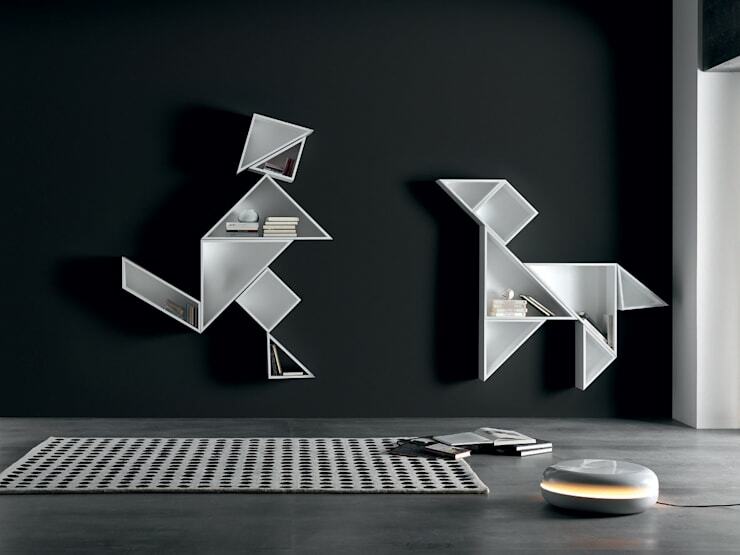 Get playful with your books with a fun and quirky set of bookcases like this child-and-dog pair. No matter how serious the rest of your decor may be, these will reveal a silly side, and offer a wonderfully unpretentious way of displaying your books. Warning: these shelves are real scene-stealers, so you may want to keep the rest of the room’s decor fairly minimal to avoid overdoing it. If you want to keep things ultra minimal, then you can carefully select a few books whose colours really suit the room, and display those rather than having your entire library sitting in your living room. The rest of your collection can be kept out of sight in a chest or in your bedroom or study. 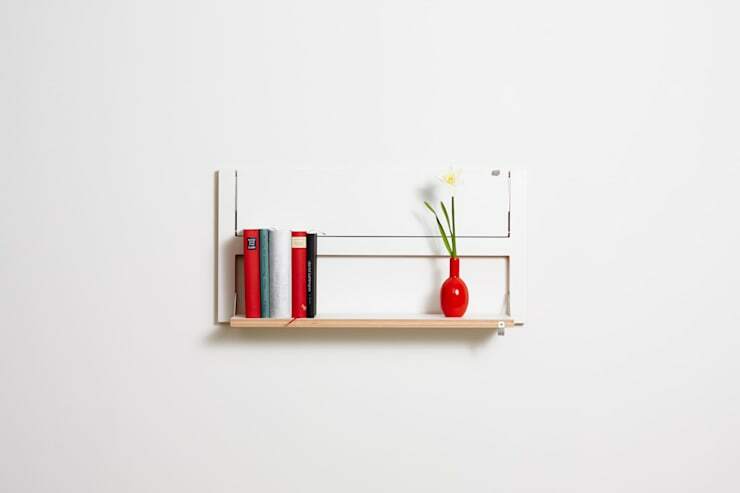 The gorgeous simplicity of these shelves is the ideal complement to the strong colours of the vase and the chosen books.